Pankaj had made his intentions very clear from the very initial stages of this snooker competition. 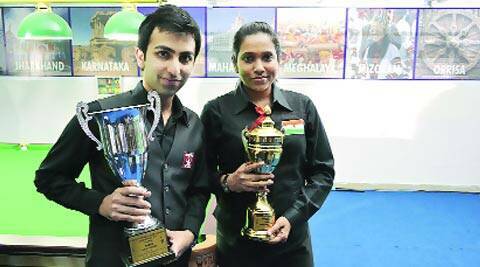 Eight time world champion Pankaj Advani of Petroleum Sports Promotion Board (PSPB) outclassed Kamal Chawla of Railways 6-3 (85(84)-00, 38-88, 70-15, 90(69)-03, 36-64, 100(61)-05, 23-85(85), 86(64)-00, 139(139)-00) to bag the men’s snooker title in the Manisha Billiards and Snooker Nationals, in Lucknow on Friday. Twenty-eight-year-old Pankaj had made his intentions very clear from the very initial stages of this snooker competition. He had opened his campaign with a clearance break of 145 and in Friday’s final he nearly managed to match his career high with a break of 139. Advani didn’t have it all his way however. After he lost the first frame, Kamal levelled the scores in the very next frame. Advani once again edged forward over the next two frames to take a 3-1 lead but Chawla hit back once again to decrease the margin. But as the match progressed, Advani began hitting his stride and he took the title in style with the massive break. Advani however will have little time to celebrate his snooker win. He now has billiards on his mind for on Saturday, Pankaj flies to China where he plays the Haikou Open from March 10 to 16. The women’s snooker crown went to Vidya Pillai of Karnataka who defeated statemate Chitra M by 4-3 (38-67, 16-55, 63-29, 96(76)-08, 36-70, 56-42, 56-47), to clinch her eighth title. The result was doubly special for Pillai as she had returned to the game recently after taking a break when pregnant. “I have a two-year-old son. I had taken a break of seven months when I was expectant and had started playing again only when he was six-month old. It is not very easy when you return after a long break but I am happy that I was able to excel again,” she says.